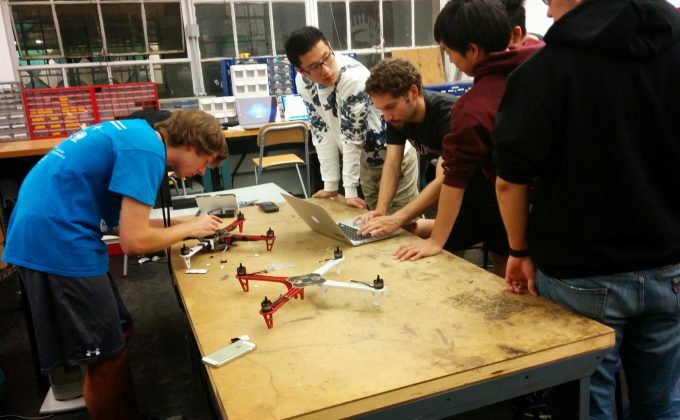 The Unmanned Aerial Vehicle (UAV) Team is a student-run group which aims to teach members of the MIT community the necessary hands-on engineering skills involved in building aerial robotic systems. They write code, prototype electronics, and machine parts to build quadcopters for remote-controlled and autonomous flight in indoor and outdoor environments. Flight: Develop firmware for the UAV’s autopilot – a circuitboard which is responsible for handling low-level tasks like processing sensor data and controlling flight. They also work on-ground station software, which is a set of tools to command and monitor UAVs when they are in flight. Navigation/Perception: Using open source robotics frameworks, they work on the high-level aspects of the aircraft, such as flight simulations, localization and mapping in an unknown environment, automatic flight plan generation, and recognition of features. Design: Build the body and electronics of the UAV. From designing and assembling the frame, to mounting motors and ESCs, to wiring electronics and sensors, to performing calibrations and flight tests, they handle all things mechanical and electrical.